Description: Prostrate plants with pale green leaves, woody stems and bright orange flowers. There are many varieties of ilima, and although they have the same botanical name, morphologically they appear quite different. Some types grow into bushes, while others, like this one, lie flat. Even leaves and flowers can differ between dissimilar varieties. Distribution: Naturally, ilima papa is found on all the Hawaiian islands and many other places in the Pacific. All grow near the ocean in what is called the "strand vegetation" zone. Here, the plants are exposed to extremely harsh conditions such as salt spray, wind, intense sun and heat, and drought. Because of this, plants in this zone generally have similar physical characteristics. Landscape use and care: Plant ilima papa as a ground cover anywhere that is dry, has full sun and has nonclay soil. Space plants 1 1/2 to 2 feet apart. Do not overwater. The best thing to do is to soak the ground and not water again until the soil has completely dried out. If you water too much, you'll notice that the plants will get quite tall, especially if planted too close. Eventually the leaves will start to yellow, even droop -- signs often mistaken for drying out, so people give more water to the already drowning plant. If you notice this happening to your plant, feel the soil first -- if it's still moist, let it dry out. Bugs that sometimes feed on this plant are mealybugs that are usually brought by ants, and whiteflies. Get rid of ants with granular pesticide, and treat the plant with any store-bought pesticide that specifically kills mealybugs and whiteflies. Slugs and snails also like to live under ground covers, so if you know your area has slugs or snails (the big African kind, not the endangered Hawaiian kind), treat the area with slug and snail bait. This plant is available at Home Depot in 6-inch pots and at our nursery in Kaneohe in 4-inch pots for about $1.50. 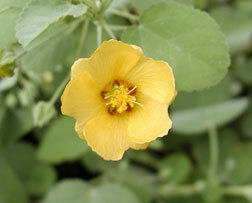 Uses: Ilima is the island flower of Oahu and is used to make leis. The flowers can also be used as a mild laxative for babies. You can even put some in your tossed salad to add nice color by pinching them out of their calyxes (the small green cup that the petals emerge from). Don't worry about it being a laxative -- it only works for babies. An adult would have to eat half a lei to for it to have any effect. I've even used the flowers as a garnish for sashimi; it looks nice and tastes better than parsley.